"Sam" the koala, the most famous furry survivor of Australia's worst-ever wildfires, is healing well thanks to the efforts of caretakers at a rescue shelter - and she even has a new boyfriend, "Bob." 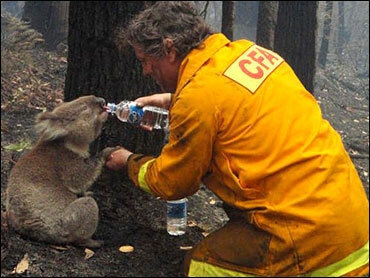 Sam, who captured hearts around the world after she was photographed drinking from a firefighter's water bottle, has also won the affection of "Bob," another koala whose paws were scorched in the weekend's inferno, caretaker Lynn Raymond said Thursday. "Bob is her protector - as soon as she is moved, he's on the move, too. It really looks like he's making sure she's OK," Raymond said from the Mountain Ash Wildlife Shelter in Rawson, 100 miles east of Melbourne in Victoria state, where the deadly fires continue to burn. "They're good company for each other." On Thursday, Tree clarified to The Associated Press that the rescue occurred Sunday, Feb. 1, three days after the fire initially broke out, and not last Feb. 8 as the AP previously reported. Tree and his crew were conducting backburning operations to help contain a clutch of six fires that the Country Fire Authority called the Delburn complex. The fires started on Jan. 29 and destroyed 30 houses, cars and other property before being contained, though not extinguished, on Feb. 7. No one was killed in the Delburn complex of fires, though more than 180 people have died in other blazes in the region. Tree said he crouched down and held out a bottle of water for Sam to drink, which she eagerly accepted, holding Tree's hand as he poured water into her mouth. "You all right, buddy?" Tree asks in a video of the encounter as he approaches the koala. Later, as Sam gulps from the bottle, he quips: "How much can a koala bear?" Often mistakenly called koala bears because they resemble a child's teddy bear, the marsupial is actually a somewhat ornery creature with a loud growl and sharp claws. Sam and Tree were reunited at the shelter on Wednesday, a meeting that left the 44-year-old firefighter fighting back tears. "When I saw her, I was just overwhelmed," Tree said Thursday. "I got a bit choked up, got a bit of a gut rise." Tree was relieved to see his little friend doing so well, and plans to give her a cage that currently houses his 11-year-old daughter's canary. "We'll worry about the canary later," he said. Sam, who suffered second- and third-degree burns to her paws, has been sharing a cage with Bob, who took an immediate interest in her when she arrived, Raymond said. Both Sam and Bob were given painkillers when they first arrived, but they're off the drugs now, Raymond said. The two are still receiving antibiotics. For now, though, the famously thirsty marsupial appears to be on the mend. "I'm just looking at Sam now - she is fast asleep," Raymond said. "She's doing very, very well." Tree told the AP on Thursday the intensity of the media interest in the koala's rescue caught him completely by surprise, but he was concerned that it did not overshadow the tragedy of the lives and property lost in the blazes.